There are no atheists in foxholes: A World War Two soldier's Bible. Here's an interesting pocket Bible. It was given away to soldiers across the British Empire during World War Two by the British and Foreign Bible Society. This one to a soldier in the Australian Army. It cannot be rare, however I am unable to find any identical in the online catalogues of the usual Australian cultural institutions. If you know of any similar examples - please let me know. This one bears the symbol of His Majesty King George VI. It is 120mm high and 76mm wide. I just checked the Integrated Catalogue of the British Library and cannot find it there either. I've recently come across these two photographs. They appear to be of the same ship and the upper photograph has "HMAS Canberra 1940" written on the reverse. The other photograph seems to be of the same ship. Some other photographs in the set were taken in Sydney Harbour from the Manly Ferry, so I think it's likely that this was taken in Sydney Harbour too. I'll check with my friend Mac Gregory who served in HMAS Canberra and see what he thinks. Researching an Australian soldier of World War One. Part 2. 1. His military record of service held at the National Archives of Australia. As a gift to Australia, the National Archives of Australia has scanned and made available online all existing World War One service records. Joe Cox's service record runs to 48 pages. Place of birth: Orange N.S.W. Age on enlistment: 26 years, 9 months. His "Casualty Form - Active Service"
Shows that he embarked on the troopship Argyllshire at Sydney on 30 October 1916 and disembarked at Plymouth (U.K.) on 10 January 1917. 17.5.17 - Embarked for England on ship Warilda. Died 18 September 1917, Killed In Action, Belgium, particulars not yet to hand. 2. Red Cross records from the First World War held at the Australian War Memorial. See explanation here. See direct link to search function here. WARNING: These files often contain graphic descriptions of violence and killing. Using that search function and entering Joe Cox's service number 6063, 4 results are returned. Two of them relating to Joe Cox. Clicking on the 2 relevant results, they yield the same digitised record. A five page file from the Red Cross Wounded and Missing Enquiry Bureau. "He was tall, dark, and came from N.S.W.. He came over with the 17th to 22nd as reinforcement. He was killed with 6 others by a shell in a Dugout at Ypres, near Westhoek Ridge on 18th September, 1917. We left that night and did not find them till three days afterwards when we went back to the same place. I saw the remains that had been dug out; Cox's head was blown right off; we could only recognise him by his disc. They buried them near the Dugout. Lt. Tyles of the 22nd was in charge of the burial party. Nothing was put on the grave at the time as far as I know. We left the next night day." 3. Collections Search at the Australian War Memorial sometimes yields photographs or relics relating to a serviceperson. Let's search for his service number "6063" and select from the conflict drop down menu as "First World War 1914-1918. There are no results. Next I tried searching for "Joseph Cox" during the First World War - again there was no result. 4. Australian Army War Diaries at the Australian War Memorial. We know that Joe Cox was of the 17th Reinforcement for the 22nd Battalion. At the AWM we find an index of units from all service arms here, and a brief summary of the 22nd Battalion's service here. We learn too that 22nd Battalion was part of the 6th Brigade of the 2nd Division. Useful facts to keep in mind if ever reading some of the larger histories of the war. Now to the war diaries of Joe Cox's unit. The listing of First World War war diaries it here. Infantry units' war diaries are here. And the ones for the 22nd Infantry Battalion are here. Reading the war diaries gives a very good idea of the day to day activities of Joe Cox and his fellow infantrymen. It mentions their movements, actions and in particular detail their training. Let's look at the one for September and see what it has to say about 18 September 1917, the day of his death. PLACE: In Line WESTHOEK RIDGE - In Camps and Bivouacs as Div. Reserve. Summary of Events & Information: In the line during the day. Relieved on night 18/19th by 18th Bn. A.I.F.on left portion of Bn. sector and 25th Bn. A.I.F. on right portion of Bn. sector. Bn. moved back to HALIFAX AREA H.14.b. (Sheet 2.[?] N.W. 1/2000) Bn. occupied huts in VANCOUVER CAMP. Casualties 1 Off. (Lieut. G. O. GREIG) 20 O.R. killed and 49 O.R. 's wounded by shell fire. So that's it. Joe Cox was one of 21 men of the 22nd Battalion killed by shell fire that night. 5. Collections search at the State Library of New South Wales. The SLNSW holds an enormous amount of information about people who were born in or lived in New South Wales. This includes a large collection of photographs of Firs World War service personnel. It's often useful to search their collection to see if there is anything relevant there. I searched for "Joseph Cox A.I.F." and "Private Joseph Cox" but there was no result in either case. The Australian Defence Force Academy (ADFA) hosts The AIF Project: "Its major activity is the construction of a database that draws on a wide range of sources to provide details on the 330,000 men and women who served overseas in the (First) Australian Imperial Force, 1914-1918." and searching the database we find that there is a page for Joe Cox. "Commemorated in Dubbo (Old) Cemetery, New South Wales. Headstone states place of death as 'Westhoek Ridge, France [sic]'. Parents: Francis (d. 14 April 1918, aged 64; bu. Dubbo [Old] Cemetery) and Martha COX (d. 13 November 1948, aged 93; bu. Dubbo [Old] Cemetery), Dubbo, New South Wales"
7. The Commonwealth War Graves Commission. Back to where we began our search for "Joe Cox - died in first war"
6063, 22nd Bn., Australian Infantry, A.I.F. Son of Martha Cox, of Dubbo, New South Wales, and the late Francis Cox. Born at Orange, New South Wales. Researching an Australian soldier of World War One. Part 1. Let's have a look at how we identify an Australian soldier of The Great War from a photograph. Here he wears a typical World War One soldier's uniform of the Australian Imperial Force (AIF). Complete with fur-felt slouch hat, rising sun insignia on the collar tabs and puttees on the lower legs. This portrait has been taken in a photographer's studio in front of a painted backdrop. Typical of the period, such portraits were often taken after basic training was completed, and before a soldier was sent overseas. But which one of the more than 375,000 Australians who enlisted for service in WWI was he? Let's look at the back of the photo. A relative has helpfully written "Joe Cox killed in first war" and at the bottom is printed "A J Vincent Talbragar St., Dubbo"
Ok, that makes sense since the photograph came from one of my distant relatives in Dubbo, New South Wales. That makes Joe Cox one of the 2055 who enlisted at Dubbo. Since we believe he was killed in the War, he is almost certainly commemorated by the Commonwealth War Graves Commission. We can use the CWGC's record search function to find out more about him. Of these we can see 4 have Joseph as their first name. The service numbers are important, because they make it easier to do what we are about to do, search the National Archives of Australia. We go to the NAA Recordsearch function. And search as a guest. In the General Search page we use as a keyword the service number of candidate a.
searching for "2160" gives us 120 results. Lets narrow it down. try "cox 2160" as the search parameter instead. That's better. Just one result. That means: Place of Birth, Northfield South Australia; Place of Enlistment, Adelaide South Australia. Probably not him since those places are not near Dubbo.. I'll click through to have a quick look at the digital copy of his service record. I'll be looking to see if his Next of Kin has a Dubbo address. Nope. One down. Looking good! Place of enlistment, Dubbo NSW! Scanning his digitised record, I see his original Next of Kin is listed as "Father Francis Cox Dubbo N.S.W. which was later amended to "Martha Cox mother P.O. Dubbo N.S.W." But just to be sure, we had better check the other two J. Cox candidates. Probably not, but we had better check the address of his Next of Kin, who turns out to be his mother, Grace Cox of Milparinka N.S.W. I must admit that I don't know where Milparinka is, so I had better check with Google Maps. Nope, Milparinka is nowhere near Dubbo. Candidate d. Try "cox 11935"
Ok, Mudgee and Lithgow both have some directional proximity to Dubbo. Better check out the Next of Kin's address. Father lives at Lawson Street, Mudgee. So, that leads us to conclude that the Joe Cox in the photograph is Joseph Christopher Cox of Dubbo, New South Wales service number 6063. Joseph Christopher Cox. He's our man. Rest In Peace, Joseph Christopher Cox. We'll find out more about you in the next few days. The Unknown Sailor of Christmas Island - Part 8. A few days ago the 3-volume final report of the Commission of Inquiry into the Loss of HMAS Sydney II was published. Regular readers will know that I've been following the progress of the Commission very closely, particularly as it relates to the Unknown Sailor of Christmas Island. My series about the Unknown Sailor of Christmas Island is here. of surprise was given to KORMORAN. It resulted in the loss of SYDNEY." This is in accordance with my conclusions drawn from archival records here. "Firstly, Dechaineux's report on the sinking of HMAS Sydney, mainly arising from POW Kormoran survivor interrogations, stated that the Captain of HMAS Sydney was deceived and allowed himself to be placed in a tactically unsound position. Secondly, the official historian was praised for writing about HMAS Sydney's demise so as not to cause distress or embarrassment to the sons of the Captain who were themselves in rising RAN careers." Commissioner Cole has declined to make a finding that Captain Burnett was negligent, and this is fair and just to a man who cannot answer such a charge and who gave his life in the service of our nation. 2. Chapter 15 of the report is devoted to the matter of the Unknown Sailor of Christmas Island. In summary it states that the Carley Float was from HMAS Sydney and the corpse of the Unknown Sailor was almost certainly from the ship. Instead of the rather narrow search amongst officers and canteen staff of the ship, the Commission has narrowed possible identities of the Unknown Sailor to 87 people. DNA testing of the families of these "possibles" for matching to DNA taken from the remains of the Uknown Sailor may lead to his positive identification. future enable DNA testing for identification purposes. not been eliminated by 19 March 2009—see Appendix M.
who are descendants of people in the remaining group. Hmmm. "It is not known when the Navy will arrange for the testing of the 16 volunteers who are descendants of people in the remaining group." So, the Navy has had DNA samples from 16 families who wish to be compared to DNA of the remains, but have thus far done nothing to bring about a comparison test. Russell Offices, Canberra, ACT, 2600. But the navy seems to have no sense of urgency about this. It will be interesting to see how this tardiness and certainly the wrong steps already taken in attempting to identify the Unknown Sailor of Christmas Island look when compared to the project currently being undertaken in the Fromelles case by the Australian Army and the Commonwealth War Graves Commission , and the invitation for relatives of the unknown dead of Fromelles to register for DNA samples to assist in identification of remains. As I said, the Royal Australian Navy has basically given up on identifying the remains. Powerhouse Museum favourites - Part 4: The Collins medal. If this is what I think it is, then it's significant because it was presented to one of Australia's best known naval heroes for his work captaining one of our most famous though ill-fated ships. It's my second favourite. "N19261 Medal (-1) in case (-2), Australia: NSW, commemorative, presented by the City of Sydney to Captain J.A. Collins C.B.,R.A.N. for the sinking of B Colleoni by HMAS Sydney, 1940." At age 14, John Augustine Collins entered the new Royal Australian Naval College in the first intake, 1913. After various career postings he was promoted Captain in 1937 and after war came assumed command of HMAS Sydney (II) in November 1939. When the ship returned to Sydney on 11 February 1941 it was met by huge crowds, about 150,000 people. The crew marched through the streets of Sydney and were feted with a civic reception at the Sydney Town Hall. "Replicas of the plaque to celebrate the victory over the Italian cruiser were presented to ten representatives of the cruiser's company by the Lord Mayor, at the Town Hall. A plaque has been placed on the gun turret on the quarter deck of the cruiser. The Lord Mayor who carried out the opening ceremony, also presented a rose bowl to the ward room and a set of silver tankards to the officers mess. Alderman Crick also said an identical plaque would be set up in the Sydney Town Hall." This medal presented to Captain Collins is one of the replicas of that plaque. As the newspaper report states, the identical plaque to that presented to the ship was set up in Sydney Town Hall. I know it still exists, although I have not yet seen it myself. The perfect companion item to the Powerhouse Museum's medal presented to Captain Collins would be this audio recording of the speech he gave that day, held by ScreenSound Australia. The record also shows that the officers and crew were treated to a dinner at the Sydney Town Hall that night. Captain Collins relinquished command of HMAS Sydney (II) on 14 May 1941. Alas, the ship met a terrible fate on 20 November 1941and was sunk by the German raider Kormoran. There were no survivors. In the case of this medal, it will be interesting to find out how many medals were struck, and how many presented to members of the crew. Some would likely have gone down with the ship. At the moment, my guesstimate is that less than 20 would have been struck. The archives of the City of Sydney will have some of that information and part will lay elsewhere. "Late on the evening of 10 February 1941 the HMAS Sydney returned to Sydney after its tour of duty in the Mediterranean. The next day an estimated crowd of 200 000 welcomed the officers and men of the ship when they marched through the city. This file deals with arrangements for the Sydney’s arrival at Circular Quay, for a civic reception on 11 February at the Town Hall, and for the presentation to the ship by the people of Sydney of a plaque in commemoration of Sydney’s sinking of the Bartolomeo Colleoni in the Mediterranean on 19 July 1940. The file includes letters from relatives of the crew both before and after the Sydney’s loss in November 1941, seeking presentation of replica plaques to those crew unable to collect them on the day of the presentation. Navy Office’s advice was that unpresented plaques had been placed in the Sydney’s safe and had therefore been lost with the ship." It will be interesting to see the correspondence, especially any between Navy Office and the City of Sydney about the number of medals struck and their disposition. I'm trying to get a copy of the NAA file. John A. Collins went on to become a stellar person in the development of the Royal Australian Navy. In mid-1944 he was promoted Commodore and became the first Australian to command the Australian Naval Squadron, as ships of the RAN were collectively known. Prior to that a Royal Navy man had always been the senior operational commander. He made HMAS Australia his flagship, and was seriously injured in October 1944 when that ship became one of the first victims of a deliberate Japanese suicide plane. In July 1945 he returned to duty and made HMAS Shropshire his flagship. And this is where the story got very interesting for me. My father served in that ship. After the long years of World War II, the guns were silent on 2 September 1945 when the Japanese surrender was accepted aboard USS Missouri in Tokyo Bay. HMAS Shropshire was in Tokyo Bay on that day, and Commodore Collins was accorded the honour of representing the Royal Australian Navy at the surrender ceremony. You'll notice the signature at the bottom right hand corner: "John Collins". It would be nice to think so, but there was also a Stoker named John Collins, as well as Commodore John Collins in the ship on that great day. I'll have to check with my dear Dad and see. It is worth noting that apart from this medal believed to have been presented to Captain Colllins, there is one other example of the replica plaque in the collection of the Powerhouse Museum, and it appears here. So it seems that the Powerhouse Museum has two specimens of war related numismatics both of which are very rare, and highly significant. 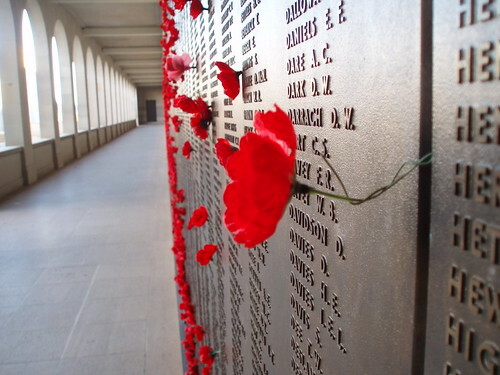 As far as I can tell at the moment, the Australian War Memorial - our nation's great repository of things military and relating to war - has zero specimens. Now, enough of things relating to war, naval history and the sea. ADDED 10/08/09: Vice Admiral Sir John Collins eventually wrote his memoirs As Luck Would Have It which were published in 1965.
there is no room for rugs forward. One Australian boy's contribution to the space race. Update added at end. 1957 was a big year. The Cold War was nearing its height and on October 4 fear of the Soviet Bear was pushed along when the first artificial satellite Sputnik-1 was launched. One night in October 1957 Denis Cox and Brian Ball were on their way to their local band hall in Mordialloc, Victoria. They gazed up trying to spot Earth's only artifical satellite, imagining what it meant for them and their nation. Then Denis and Brian got on with what they set out to do that night, and joined the Mordialloc Brass Band. Sputnik, and the threat the Soviet space program imposed on Australia was not lost on the Denis Cox, then a student at Mordialloc High School. He put his ideas for a rocket ship design down on paper and forwarded it to Australia's premier space weapons research facility, the Woomera Weapons Research Establishment, directed to the attention of the top scientist. Denis' letter was carefully filed, and was brought to light recently by the National Archives of Australia in their Find Of The Month feature. Denis supplied an elaborate design finely sketched in blue ball point ink, including important featrues such as four Rolls-Royce jet engines and guided missile armament. An obvious patriot, and in accordance with the rules of war, his design included Australian markings on the rocket ship. Realising that at such a tender age he did not yet have a definitive design, he invited the Top Scientist at Woomera to " ... put in other details.". Although the images of the Denis's letter have been downloaded from the National Archives of Australia website, the NAA has not asserted copyright over use of the images, and instead advised me that copyright of the letter from Denis Cox to Woomera's Top Scientist rests with Mr. Cox. Denis Cox has generously granted me permission to reprint his letter here, and kindly supplied the recent photograph of him. As a boy, I too was fascinated by space, rockets and astronauts. I'll write more on that when the 40th anniversary of the Apollo 11 lunar landing nears. UPDATE ADDED September 28, 2009: Last week the Australian nationally broadcast radio current affiars program ABC PM did a brief feel-good piece about this, including an interview with Denis Cox. Transcript is here. MP3 audio is here. Looks like Denis is going to get his letter - 52 years after the fact. UPDATE ADDED December, 2009: Denis Cox gets his replay from a top rocket scientist. Oskar Schindler's list is in Sydney. Last week I saw a piece of history. In the midst of the Nazi steamroller, and himself a Nazi, Oskar Schindler showed that true heroes do exist. Schindler sheltered more than 1000 Jews via the cover of his factory in Poland between 1939 and 1945; using bribery and contacts in the Nazi regieme - he saved their lives. To be on his list of enamel factory workers was to be given a chance at life when the alternative was likely death in a camp. Light first shone on the story of Oskar Schindler and the list of his factory workers when Thomas Keneally wrote his book Schindler's Ark (Schindler's List in the USA market) which won the Booker Prize in 1982 and gained a much broader audience via the 1993 film Schindler's List. In early 1945, as the Soviet Army began to edge across Poland, the Nazis permitted Schindler to move his factory workers to Brněnec (then Brünnlitz) in what is now the Czech Republic. He compiled a list of his workers who were required to transfer to the new location for submission to the government in 1945. The original lists were submitted to the government as required, and no originals have been discovered since. A few carbon copies of the list are believed to exist in the world, and one was recently rediscovered by Dr. Olwen Pryke amongst Tom Keneally's literary papers at the State Librry of New South Wales. It was found by Dr. Pryke whilst she was examining six boxes of papers relating to Keneally's book. The papers were acquired by the library in 1996, but nobody had recognised the significance of the flimsy pices of yellowing paper. Tom Keneally was reunited once again with his manuscript and papers relating to his book at the State Libraryof New South Wales, and is shown here with the rediscoverer, Dr. Olwen Pryke. The List is on display at the Nelson Meers Foundation Heritage Collection in the State Library of New South Wales. It is accompanied in the display by the original manuscript of Keneally's book. Until November 2009. You can also see it online here. Mac Gregory to lead Melbourne's ANZAC Day march tomorrow. My friend Mackenzie Gregory has been accorded the honour of leading the march in Melbourne tomorrow. News stories here and here. See previous parts in this feature series here under my blog category "The Unknown Sailor". The body of the Unknown Sailor of Christmas Island was retrieved from a life raft near Christmas Island on 7 February 1942. 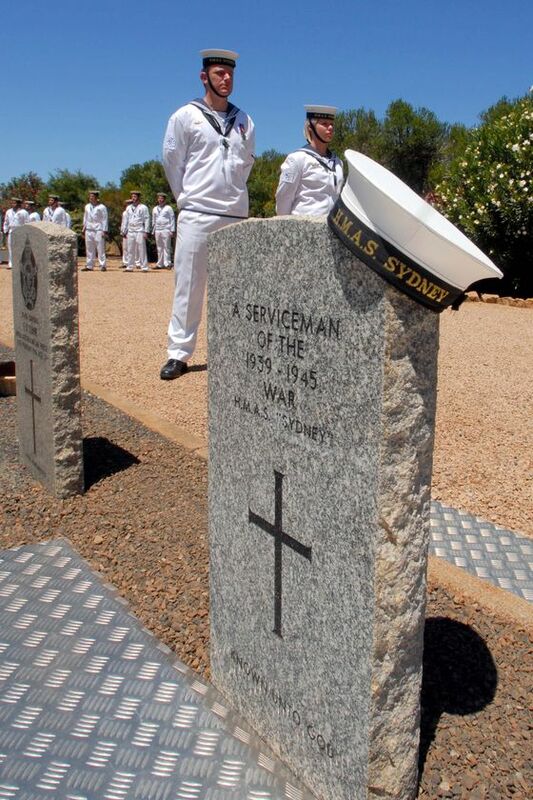 The Sailor is thought to be the only known body anywhere from the 645 crew who perished with the ship HMAS Sydney (II) during World War II. The body was buried shortly after that in the cemetery on Christmas Island, and was retrieved by a Royal Australian Navy led expedition in 2006. Since then a number of means of trying to identify the body have been followed, finally centering around DNA testing of surviving relatives. As I have said before, the identification team, based upon supposed testing at the Australian War Memorial which suggested that the Sailor was wearing a WHITE boiler suit seems to have ignored eyewitness acounts from the time which stated the sailor was wearing a BLUE boilersuit. Thus, I proprosed that the identification team concentrated their efforts in gaining DNA matches from survising relatives on the wrong group within the crew. Further testing by the Australian Federal Police has indicated that the press studs found with the corpse contained BLUE material, not WHITE material. Ms Challenor's evidence. I don't know. they were white originally, or blue and have faded? there was no very obvious evidence of that. is definitely a dye, but it is definitely a blue colour.